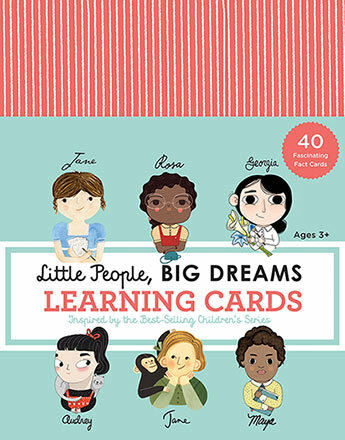 These gorgeous interactive learning cards are the perfect companion to the highly successful and educational Little People, Big Dreams series of books. As accessible as the books were to early readers, these 40 cards depicting 20 famous and influential women from actors to scientists, designers and writers to freedom fighters, are equally so. Beautifully designed, they come in a sturdy flip-top box. This is a collection designed to celebrate achievement and empower children to aim high and dream big. Each profile has two cards with a stunning illustration of the person on the front. The card introducing the child has brief facts about their dreams in childhood, what they were like, their habits, character, and date and place of birth. Then there is the adult image with a fabulous quote beneath it. On the back of this is a photograph accompanied by biographical information under four titles: The Basics, Famous Achievements, Notable Facts, and Fun Facts. There are also three additional Matching Game cards to use to challenge your memory of what has been learnt on the cards or in the books. One has the person’s real name before they changed it, to be matched with their adopted name. The second is a match their name and place of birth, and their milestones. The last has the name of a pet to match the famous person with, plus a crossword puzzle of writer’s names on the other side. 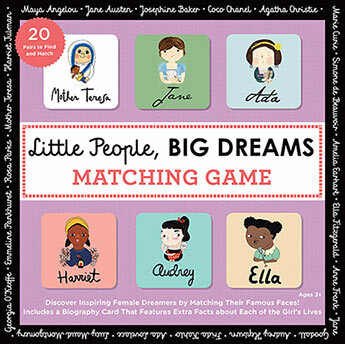 Released at the same time is Little People, Big Dreams Matching Game. It is set of memory cards depicting the same famous people from the Learning Cards, for the 3+ age group. This set comes with a biography card listing extra facts about these famous women’s lives. There are twenty pairs to find and match. Visually stimulating and interactive, they reinforce the images on the card collection and the information the books have presented. They are produced in an extra thick cardboard for longevity. There is a slight difference in price for the memory cards from the learning cards, but they are both worth having, equally as valuable as entertainment and learning tools.